Grow your own … food that is! Lake Farm is part of the American Ideals Foundation (AIF) national/international job training center in Ruskin, near Sun City Center. The farm project is one of many facets of the AIF, in this case promoting sustainable farming and gardening. “Keep it growing,” exclaims Robert Moffa, director of AIF. 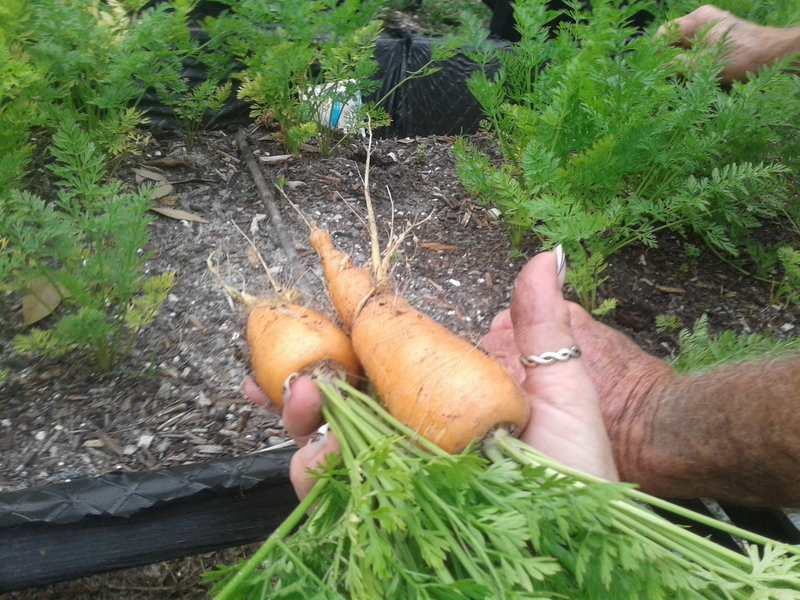 Mercedes Moffa pulls carrots from the ground as part of a training on organic farming, which includes nutrition, protecting resources and native plants. For more than 40 years, the AIF, a 501(c)3 nonprofit, has honored, supported and recognized the importance and the crucial role of the American farmer. AIF founder, Robert Moffa, was raised on a farm, and this issue is very close to his heart. In 1981 Moffa created the National Farmers Memorial, which was built by the AIF at the Agricultural Hall of Fame in Bonner Springs, Kansas, and was the First National Monument outside of Washington D.C. that was recognized by Congress. One of the new AIF projects is developing Lake Farm in Ruskin, just east of I-75. This pristine 10-acre property is now the site for the new national/international Job Training Center with Lake Farm, teaching in a practical, hands-on way how organic sustainable farming and gardening can preserve humanity worldwide. “The AIF is thrilled to have experts from around the world coming to our Job Training Center to teach individuals/groups of all ages many different subjects. Our main objective is to teach skills that will help educate, encourage, and strengthen our veterans, children, disabled and our communities worldwide,” remarked Moffa, AIF founder and CEO. According to the foundation’s Education Director, Mercedes Moffa, Lake Farm is teaching and training how organic farming is important and providing education about nutrition and protecting our resources, wildlife, native plants, and a large range of other subjects. According to Mercedes, the learning and growing experience will teach individuals how to grow food to survive and to embellish the existing food purchased. The Lake Farm project includes job training and hands-on tours that can consist of many types of groups or individuals with classes for all different ages and different topics. The American Ideals Foundation, Inc. is asking agricultural-related corporations and businesses to become sponsors or supporters. “It is important we never have to charge for this farm experience. The Lake Farm has no paid employees or staff, just volunteers,” points out Moffa. As a 501(c)3, nonprofit, tax deductions will be given for donations of goods, services and financial support. AIF will also publicize sponsors at its various events worldwide.